For a full-body workout, choose an elliptical machine with moveable handles. The elliptical machine provides you with a solid cardiovascular workout that builds lean muscle mass and burns calories. Because the elliptical allows you to adjust the incline, you can personalize your workout for your own fitness goals. At the lowest level you engage muscles similar to those used in cross-country skiing, at the medium setting you engage muscles similar to those used in biking and at the highest setting you engage muscles similar to those used on the stair climber. 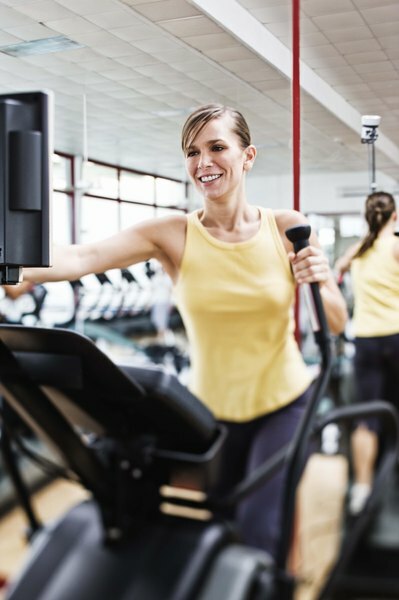 An elliptical machine provides a low-impact workout that is a solid alternative to running. This machine was designed to mimic the body’s motion when running but without the impact. When you are on the elliptical machine, you are in a standing position so your body engages most of your major muscle groups. If your elliptical machine has moveable handles, then you are engaging all of your major muscle groups. This beginner workout is designed to introduce you to all of the different features on the elliptical machine. When pedaling forward, you emphasize your quadriceps and when pedaling backward, you emphasize your hamstrings and glutes. To work your chest, push the handles, and to work your upper back, pull the handles. For this workout, begin with an easy three-minute warm-up. For the next seven minutes, pedal forward at resistance level 5. Then pedal backward for five minutes at resistance level 7. Switch and start pedaling forward at the same resistance level for another five minutes. Finally, focus on pushing for two and a half minutes and then focus on pulling for two and a half minutes. Cool down at a level 3 resistance for five minutes. By adjusting the incline and resistance on the elliptical, you can get a heart-pounding workout in only 30 minutes. Every five minutes you will adjust the incline and resistance to keep your body challenged. Begin with a five-minute warm-up with the incline at level 3 and resistance at level 4. Then lower the incline to level 1 and increase the resistance to level 6 for five minutes. For the next five minutes, increase the incline and resistance both to level 7. Next, increase the incline to level 10 and the resistance to level 8. For the next five minutes, increase the incline to level 15 but lower the resistance to level 7. For the final interval, which is only two minutes long, increase the incline to level 20 and the resistance to level 10. Finish with a three-minute cool-down at an incline of level 3 and a resistance of level 4. 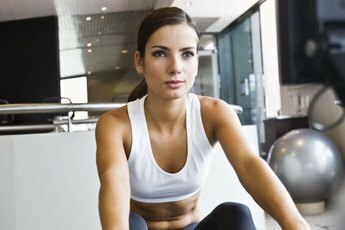 To focus on your core when on the elliptical, let go of the handles. By not holding on, your body has to engage all of the muscles in your core to keep you balanced. The faster you go, the more you work your core. For this workout, mix hard intervals with easier recovery periods. You can hold on during the recovery periods. Following an easy five-minute warm-up, switch every five minutes between hard and easy intervals. Your hard intervals should be at a resistance level of 6 or higher, and your easy intervals should be at a resistance level of 3 or 4. Aim to complete five to seven intervals.